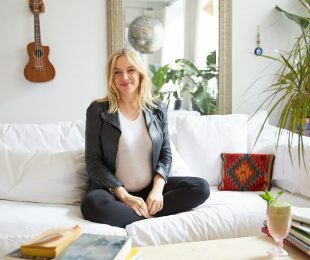 “WHENEVER YOU ARE LOOKING OUTWARDLY FOR APPROVAL OF YOUR WORK, IT’S NEVER GOING TO BE SPARKED FROM THE SOULFUL PLACE WITHIN YOU THAT GENERATES THE MOST BEAUTIFUL AND UNIQUE CREATIVITY,” SAYS ARTIST MICAELA EZRA. 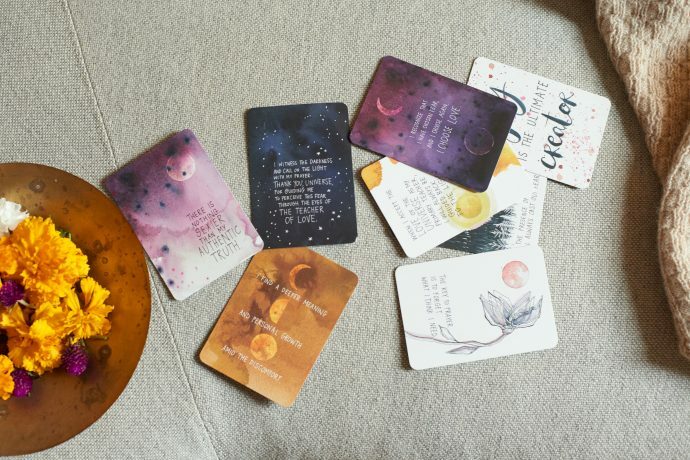 “If you’re only operating from a place of being concerned about judgment then you are stifling your own work.” Ezra, a longtime friend of Gabrielle Bernstein, collaborated with the author on their Universe Has Your Back motivational card deck, for which Ezra designed the illustrations accompanying the inspirational quotes. 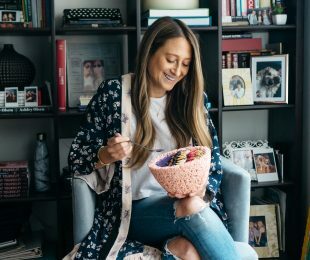 An Australian native and mother of two, Ezra also is also founder of AHYIN, a boutique collection of contemporary Judaica objects, created with holistic intention, which includes heirloom pieces like Challah covers that you can find at chic retailers like ABC Carpet & Home. 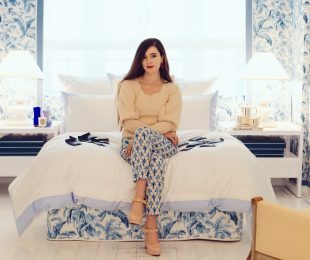 We caught up with the illustrator and textile designer to talk affirmations, her approach to nourishing her family and what she misses most about the Land of Oz. These cards are so beautiful. 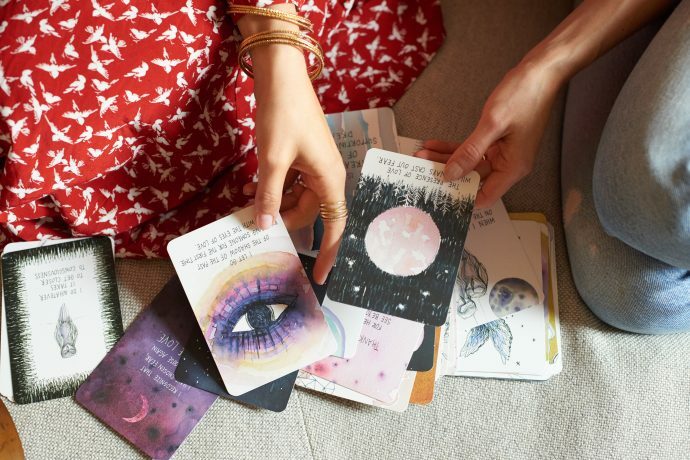 How would you recommend to use an affirmation card for someone who has never used one before? You can pick it in the morning and set an intention for the day. I like to pick three cards – one representing where you were, one representing where you are now and one representing where you’re going. Where do you find people keep these cards? Next to their bed or on a coffee table! A lot of people I’m seeing are becoming creative. One girl mounted one deck on her wall as a beautiful mural. Some people are putting it on their altars for when they meditate, creating little moments around them with crystals. Are there certain favorites that you have? My favorite is the owl that says, “I do whatever it takes to get closer to consciousness.” It depends on the moment but I like a lot of the ones that are saturated in color. There’s a mustard one that says, “I find a deeper meaning in personal growth amidst the discomfort.” The color is saturated. I’m a big believer that color reflects your mood but it also affects your mood. Depending on where you’re at, you may be drawn to a different thing just because of the mood that the color evokes. Do you use mainly watercolor for these? For me, yellow conjures up a lot of joy and that’s why I used it for the card, “Happiness is my birth right.” The bordeaux and deep violet tones are a bit more moody and sensual so they come with different quotes that are connected to that feeling. You and Gabby have remained such close friends and collaborators, what is the secret to maintaining a friendship through life phases? We met each other in a junction in our lives where we both needed each other. We needed a soul friend – it sounds so corny to say that but we both recognized the light inside each other very rapidly and, because of that, we were each other’s cheerleaders. It was never a friendship because of superficial needs, it was a very deep friendship from the beginning. I believed in her, she believed in me. What’s your favorite nourishing meal? My big meal of the week is Shabbat, so I love cooking for Friday nights. I definitely err on the side of Mediterranean or Moroccan. I love Israeli food too. At the moment, I’ve been making a lot of meatballs from a recipe from my mum or za’atar chicken. We do a really good couscous. Miguel, my husband, is going to say I’m stealing his recipe but I make the couscous with little bit of vegetable stock I separately roast chickpeas in curry powder and some chopped up carrots. I’ll do almonds or pine nuts and raisins and mix it all in. Sometimes add pesto on top. I like it when you put the raisins and the pine nuts through it and then the carrots and chickpeas in the middle with some drizzled vegan pesto. At the moment, nothing because I’ve got a shoulder injury. But usually, I go to Yoga Shanti and I really love that. They combine Iyengar principles with Vinyasa flow so you get the anatomically correct posture that you get in Iyengar but it’s still got life and vitality and isn’t as dry as an Iyengar class. Favorite places to eat in the city? I’m really excited that all of the Australians have moved here with all of the cafes. 10 years ago, when I came here, we would have black coffee from the diner and an omelet and that was it. Now I can get a really good latte and an avocado toast. I like Bluestone Lane, Toby’s Estate, there’s a new one on Sullivan Street called Banter. Ruby’s was the original – they were here 10 years ago but they were the only one. I think we’re taking credit for it because it just blew up in Australia. Avocados are Mexican or South American but you cannot find a restaurant in Australia without an avocado toast. They do a lot of avocado toast with vegemite – I’m not a big vegemite person though. It’s the byproduct of making beer. The yeast becomes the vegemite. It’s very rich in Vitamin B-12 and other nutrients. You get accustomed to the taste, it’s just really salty. Lamingtons are my favorite Australian-style cake, which is a white sponge cake covered in a thin coating of dark chocolate and coconut sprinkles. Do you do any self-care? I occasionally go to acupuncture in the city with Amy Ralph, she’s incredible. I don’t have regular massages or facials so my self-care is pretty minimal. I’m very big on bringing myself back to the present moment and finding the beauty with whatever I’m doing. What about your beauty regimen? I’m very low-key when it comes to maintenance. I use the Tata Harper Exfoliating Cleanser and the Rejuvenating Serum. I use another brand called Osmosis which is a really good moisturizer. I don’t think it’s organic but it isn’t super harmful. I also love to use are pure Argan oil on my face a few nights a week, Moroccan black olive oil & eucalyptus soap which I discovered on my honeymoon, but now you can get it in NY! Also Witch hazel and Paw Paw ointment if I or the girls have any irritations. On them, I use California Baby Calendula moisturizer and bath products. For makeup, I love Clé de Peau – I swear by their concealer. That has pretty good ratings on the environmental checklist. And then I just wash my face in the shower! I’m not too crazy. How would you describe your approach to being a mom? Do you have a non-negotiable thing you do for your well-being everyday? I’m big on nighttime prayer and morning prayer. It’s a 2 minute or less thing and I’m very mindful in the morning. When I wake up, I say a Hebrew prayer. Before I go to sleep, I say a special prayer with my daughters, too. Take us through a day in the life of meals? Breakfast is usually oatmeal, raisins, sometimes chia. Lunch is avocado toast. It’s the easiest thing. I’ll use Bread Alone Miche bread or Ezekiel Sprouted Whole Grain and Seed Bread then add avocado, lemon, salt and pepper – it’s so good! What is your approach to nourishing your family? My philosophy is everything in moderation – 80% healthy. I’m lucky that they’re adventurous eaters and will try different things so we have a lot of vegetables and lots of grains – farro, peas, lentils, different combinations of those. I’ll make soups with literally water in the pan, chicken, throw in grains, throw in carrots, throw in zucchini and whatever is on hand. We’re pretty relaxed on our approach. I’m not a “no-sugar mum”. I’m like, “You can have a treat when you need to have a treat.” Now, she takes a bite and then walks away from the cake. My favorite thing is when they say, “I’m not hungry anymore,” because I know they can hear their body and its needs.